In the 1970s and '80s, the behavioral researcher and psychologist Prof. Philip Zimbardo tested the effects of extraordinary situations on human subjects. Zimbardo was less concerned with demonstrating the personal situations, developments and psychological case studies of individuals, and rather was searching for universal relationships between external influences and the behavior of the subject (Bierbrauer & Steiner, 1984). Such influences are to be observed in situations of extreme duress, as illustrated by those in prisons. After World War II there were a multitude of reports from prisoners about their personal experiences, the influences and effects of their respective time in prison. Zimbardo now wanted to observe the effects of prison on a universal level. He thus clearly separated the personal psyche of the individual from the factors that would encroach from the "outside", making them equal to prisoners. The core question Zimbardo was experimenting with was the question of the "good" and "evil" in humans. Would good or evil triumph in individuals who were subjected to extreme stress and were required to resort to violence? What influence does the environment have on this decision? Who is actually responsible for reporting extraordinary violence in prisons? Is it the special characters and individuals gathered within the prison, or must this phenomenon be ascribed to the imposed prison environment? 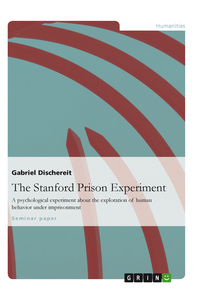 For Zimbardo, an experiment was required which simulated the exceptional situation of a prison under virtually realistic conditions. The prison, a location shaped by artificial power structures and unnatural authorities, seemed to the scientist to be the proper environment for answering the question of the influence external factors have on authoritative behavior and man's inclination toward violence. 21 participants took part in the experiment. They were selected from a group of 75 individuals who had volunteered in response to a newspaper advert. The selection occurred based on physical and mental stability. Individuals in particularly good physical and mental condition were chosen from the entire group for the experiment. Among those initial 24 people, three were assigned as substitutes in case one of the test subjects were to drop out. The data analysis is based on the total number of 21 test subjects who were randomly placed into two groups. One group was assigned the role of prison guard, the other the role of prisoner. Each participant was paid a rate of $15 per day. The test subjects were healthy, intelligent men stemming from the socio-economic middle class. None of these men exhibited any behavioral issues (Haney, Banks & Zimbardo, 1973). So as to make the prison atmosphere as authentic as possible, former prisoners and officers were brought in as external consultants. The prison was set up in the basement level of Stanford University. The cell block was separated by two walls, and the hall running between them was the prison yard. One of the walls was fitted with the only door to the cell block, and the other was given an observation window, through which video and audio tapes of the test subjects could be recorded. The prison cells were set up so that the doors of the laboratory rooms were kept separate from the cells by specially designed doors with steel bars and cell numbers. A small closet was located on the side of the corridor facing the cells, dubbed "the hole", which served as solitary confinement cell. It was dark and narrow, about 24 inches wide and 24 inches deep - large enough for a prisoner to stand upright. An intercom system allowed for the cells to be secretly bugged so the prisoners' conversations could be observed and general announcements could be made for the prisoners. There were no windows or clocks, and thus no opportunity to tell how much time had passed, eventually leading to the prisoners losing their track of time (Haney, Banks & Zimbardo, 1973). For ethical and moral reasons the test subjects could neither be detained for an indeterminately long time, nor could threats of serious bodily harm be used as a means of pressure within the experiment. It was also strictly ensured that no homosexual or racist activities arose. Aside from that, the prison guards were given free reign of how they conducted their duties (Haney, Banks & Zimbardo, 1973). Several days after the test subjects had already declared their willingness to partake in the experiment, they were suddenly arrested by local police in their own homes and brought in a police cruiser to "Stanford County Jail", where they were greeted by the acting head of the institute and informed of the grave nature of their actions and their new status as prisoners. Each prisoner was first systematically searched and had to completely disrobe. Then they were deloused with a spray. For one, this procedure was developed to humiliate the prisoners (Haney & Zimbardo, 1976), as well as to ensure that no pathogens were being brought into the prison. Each prisoner received a uniform. The main article of the uniform was a smock which the prisoners were to wear without undergarments throughout the entire experiment without undergarments. The respective prisoner number was emblazoned on the front and back of the smock. A heavy chain was fastened to each prisoner's right ankle. They received rubber sandals for footwear and had to wear a nylon stocking atop their head (Haney, Banks & Zimbardo, 1973). The guards did not receive any special training for their task. They were instead left to decide what measures they felt necessary for maintaining law and order in the prison and obtaining the prisoners' respect, within certain limits. However, like real guards, they were informed of the seriousness and dangers of their duties. Every guard wore the same khaki uniform, kept a whistle around their neck and wielded a truncheon lent by the police. They also wore special sunglasses. The reflective lenses prevented their eyes, and thus their emotions, from being seen. This allowed for them to maintain anonymity (Haney, Banks & Zimbardo, 1973). The prison simulation began with nine guards and nine prisoners. The guards worked in threes in 8-hour shifts, while bare cells were shared by three prisoners each. The cells were so small that there was just enough room for a cot for the prisoners to sleep or sit on. The remaining guards and prisoners among the 24 total participants were kept on hold in case they were needed in the event of an emergency (Haney, Banks & Zimbardo, 1973). Llewellyn's law job theory and the challenge of the current ban on prisoners' voting. Should prisoners in the United Kingdom be granted the right to vote?